Last month, Heather and I set forth to escape the summer heat in San Diego and head north to Carmel-by-the-Sea, located just south of San Francisco. Our host on this trip was the absolutely beautiful Carmel Country Inn, a bed and breakfast that offered us a 2 bedroom suite. This sea-side village is simultaneously a step back in time as well as a step forward to an almost utopia-like existence where streetlights are essentially banned and homes have no addresses, and a 10pm curfew for those under 18-years old. While quirky, it is also absolutely gorgeous with a white sand beach that rivals any found in the Caribbean but with cool ocean breezes and set among dense oaks providing abundant shade. 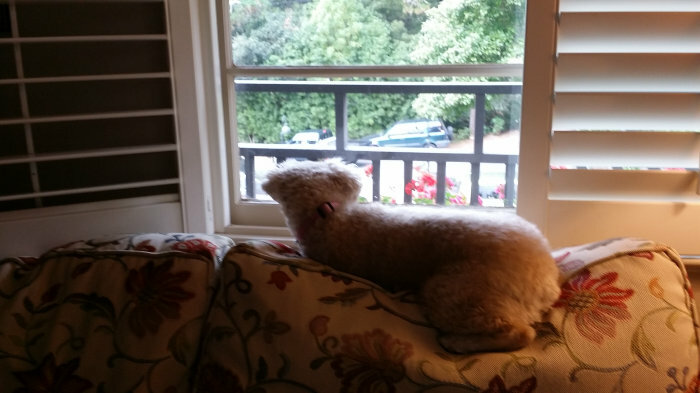 Carmel is also one of the most dog-friendly cities in the country and Carmel Country Inn welcomes dogs as well as cats .. so of course - we invited Niki to join us too! 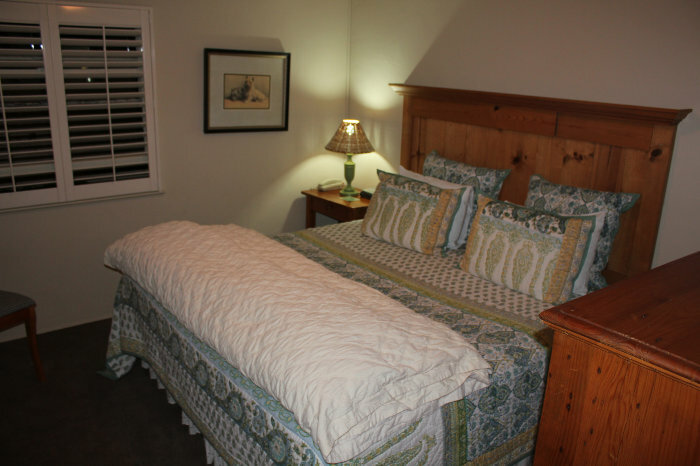 The innkeeper at Carmel Country Inn, Amy was gracious enough to offer us a 2-bedroom suite, which is equally perfect for a mancation or a romantic escape. The room we were in, suite 8 came with a large sitting room including a fireplace, couch, and TV as well as a small bar area complete with a fridge to keep beverages cold. 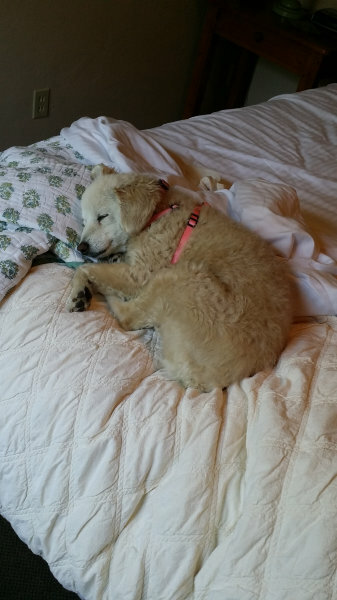 Perhaps as important as how Heather and I felt was that after running around checking to make sure it met her standards that she felt comfortable enough to curl up in a ball and go to sleep. 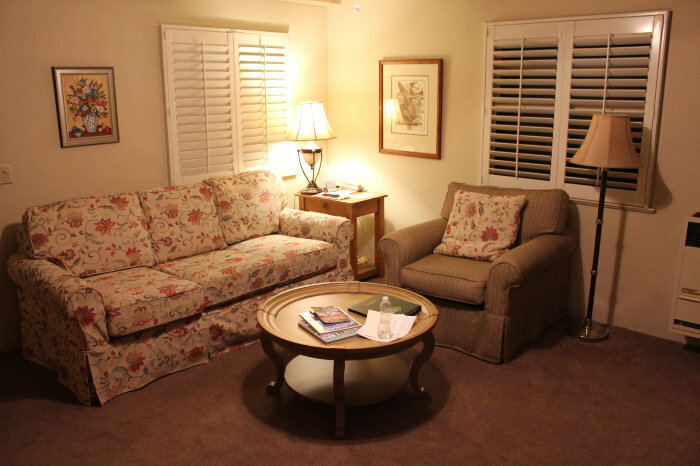 There was something calming about the Carmel Country Inn that had that relaxation effect on all three of us. This may be Carmel's environment itself with nice cool breezes and fresh air coming off the ocean and filtered through the forest of oak trees or simply our 8 hour car ride up Pacific Coast Highway from San Diego. Either way, I am confident that if your objective is to find a relaxing romantic escape this is a great place to consider. To further accentuate that point was the spectacular freestanding jacuzzi tub that Heather took advantage of - just watch out with the hose since there is no shower curtain to prevent errant spray from going crazy. 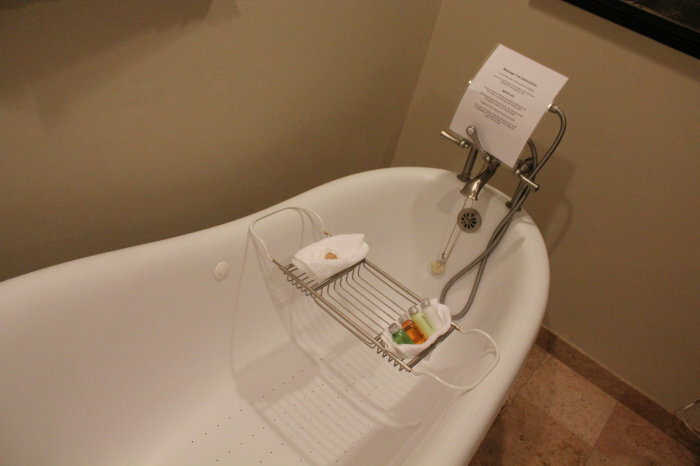 Don't worry though, there is also a shower in the main bath and the second bathroom also has a shower. Bedroom one - above - is a queen bed. 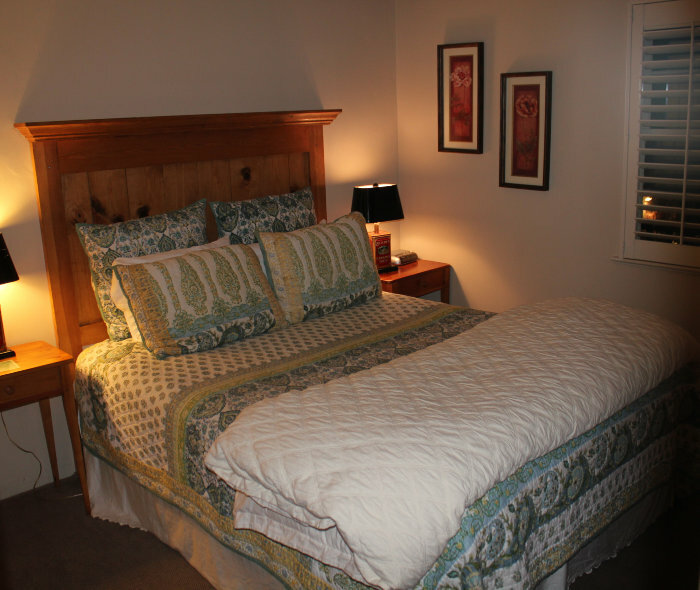 We selected the second bedroom, which featured a king bed. One thing that you will notice is that neither bedroom has a TV. This once more points to the "relaxation" nature of Carmel Country Inn since bedrooms are for sleeping and other stuff, not watching TV! The next morning, it was time to grab some breakfast! 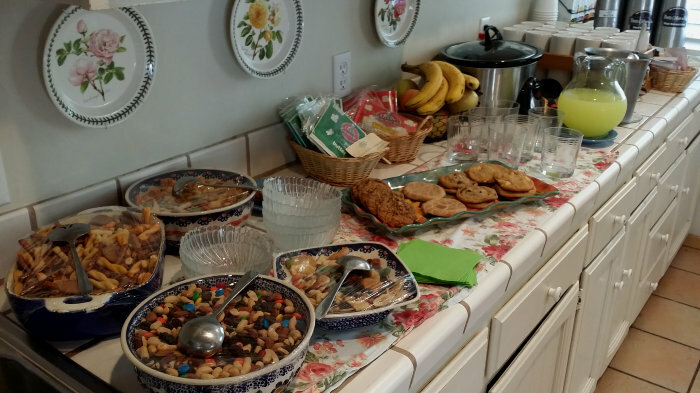 Breakfast was served buffet style with individual quiches, oat meal, pastries, and fresh fruit. 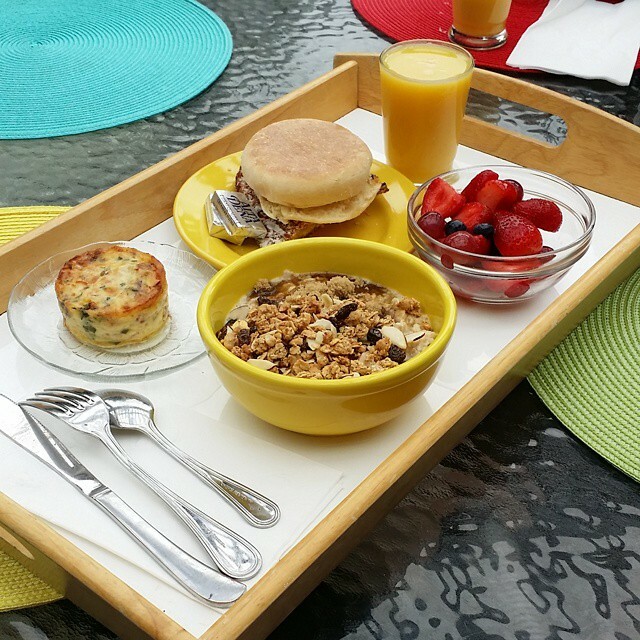 It was one of the most delicious breakfasts that I have had at any hotel ever and you can either eat inside or on the porch surrounded by flowers and plants. If you arrive with your pet, Anne will add it to her yearbook of the four-pawed guests so it was also fun to thumb through that. If you only stop by during breakfast then you are missing even more goodies that are out for a mid-day snack! Our stay at Carmel Country Inn was absolutely spectacular and my only regret is that we didn't stay longer. Rooms range from about $225 for a Queen studio to $400+ depending on the time of year for the 2-bedroom suites like we had. For those that travel with pets, you know that there is a difference between "pet friendly" and "pets welcome". 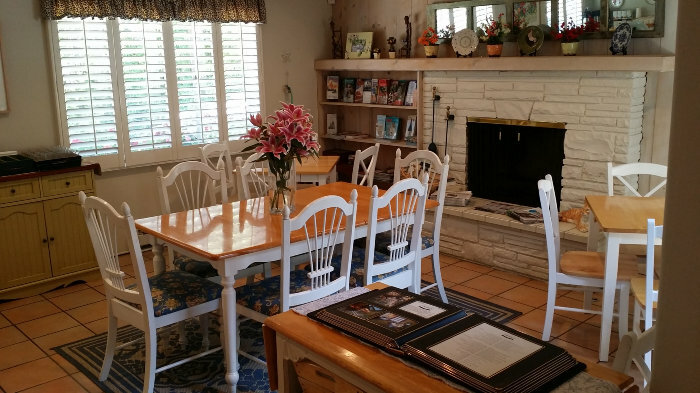 The Carmel Country Inn was absolutely a "pets welcome" bed and breakfast. From a dedicated pet relief area to allowing Niki to join us on the porch during breakfast to the strollers below and the general atmosphere in Carmel itself this is truly a great opportunity to escape with my two favorite women! 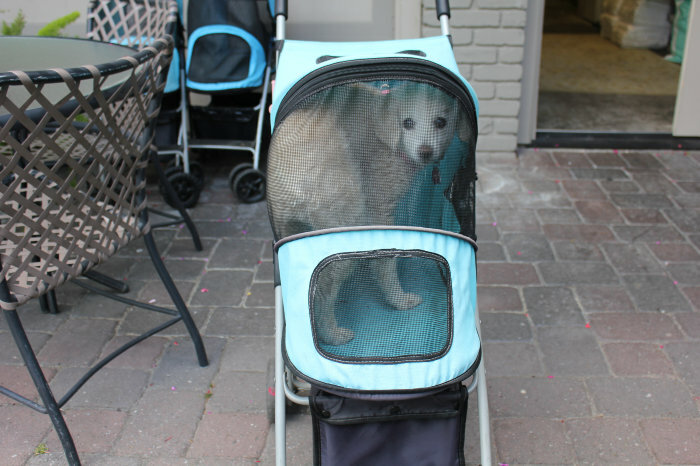 Heather and I have mocked people with strollers for their dogs but are starting to realize that in the hot California sun that sometimes it is necessary to help save Niki's sensitive paws. At the Carmel Country Inn they actually have several strollers available for dogs so we decided to try and see how Niki would react. Now we are off to explore Carmel and Monterey, so stay tuned for more!